The most beautiful island in the world. It is hard for me to describe Stromboli without being overly cliché and using the common Mediterranean stereotypes. 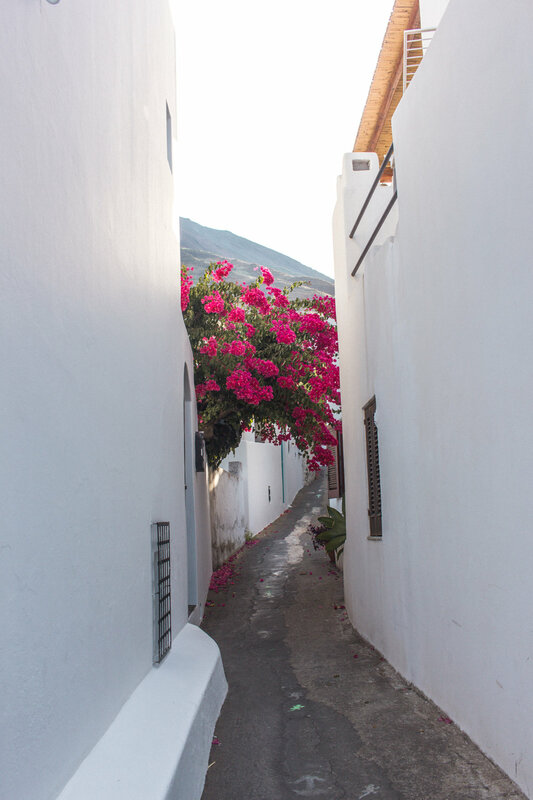 The water is blue and clear, the houses are whitewashed, and magenta bougainvillea populate every garden. Stromboli is incredibly beautiful and off the grid. Stromboli is an island in the Aeolian archipelago off the coast of Sicily. There are six other islands, and each has its own charm: Vulcano has active thermal sites and smells of sulfur, Panarea is chic and upmarket, and I discovered that Stromboli was adventurous and wild. Getting here is a easy ferry ride from Milazzo, a port city in Sicily. You can also get here from Messina, Reggio di Calabria, and a few large ferries continue to Naples. There are no cars on the island, because the roads are so tiny. Only ape cars (can you even call them cars) transport people and things on the island. There are two settlements in Stromboli, San Bartolo and Ginostra. San Bartolo is where everything is, and Ginostra is smaller and only accessible by boat. It's very easy to walk from end to end in San Bartolo and visit the little black sand beaches and coves. 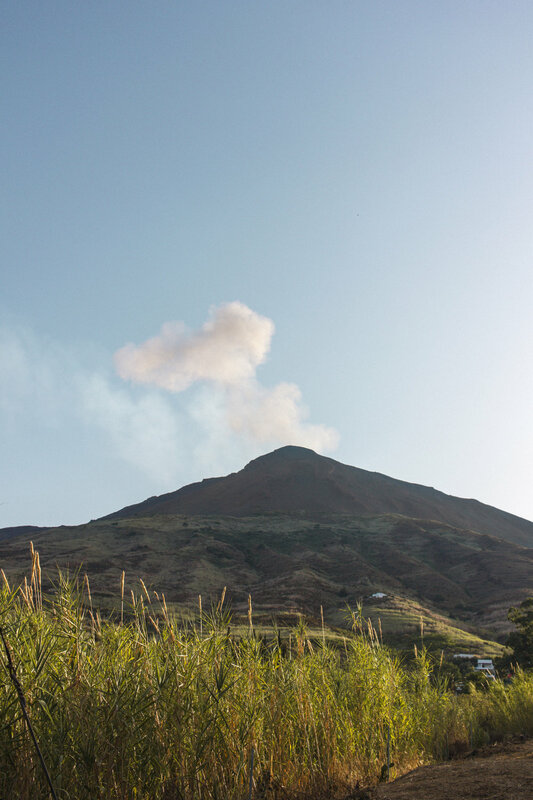 The highlight, and main attraction of Stromboli is its active volcano. Around every 15 minutes there is a large explosion of smoke and lava, which is visible from the observatory restaurant around 30 minutes out of town. It's situated on the side of the volcano so it has perfect views of the crater. I found out that every few years the geology of the volcano changes. For example, a few years ago, lava flowed down the side of the volcano, so boats would go out at night to watch the spectacle. This stopped and the volcano went back to frequent explosions. You can climb Stromboli at night, which is a once in a lifetime experience. After renting equipment (hiking shoes, helmet, flashlight) from any trekking shop, you can hike up with a guide at around 5 pm. It takes around 4 hours to climb up the 900 meters to the crater, and it's dark when you reach the top. My experience was almost apocalyptic. Clouds had condensed at the top so we couldn't see anything, and wind was blowing small particles of volcano everywhere. And every 15 minutes, just as Stromboli has done for thousands of years, the clouds lit up fire-red as the crater in front of us exploded lava a hundred meters into the sky. The descent then takes one hour, and you're practically running down black sand in the sciara del fuoco - stream of fire. Expect to dump loads of sand out of shoes at the end. Stromboli is incredibly romantic and off the grid. You can get the whole Mediterranean experience without the cost and crowds of her older developed sisters like Capri and Mykonos. Accommodation is largely in the form of self service rooms in houses, as there are no large hotels or chains on the island. 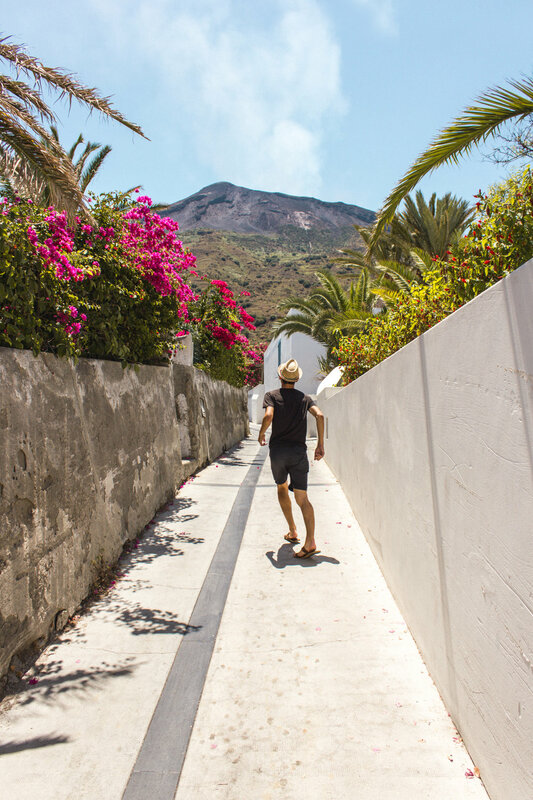 Stromboli doesn't have much in terms of tourist infrastructure, but that is what makes it such an attractive island getaway, and you can truly feel disconnected from the outside world after a few days.